Department of chemistry D.B.Pampa College celebrates the National Science Day in honour of C V Raman’s invention popularly called the Raman Effect. This program was supported by Kerala State Council for Science, Technology and Environment. The theme for this year’s National Science day 2018 is ‘SCIENCE AND TECHNOLOGY FOR SUSTAINABLE FUTURE’. Around 500 students from various departments in the college participated in the programme. The program began with prayer. Dr.P.Geetha, Head of the department of chemistry welcomed the gathering and spoke about the importance of C V Raman’s contribution towards Science and Technology. Dr. S.Joy,Principal ,D.B.Pampa College, gave a brief introduction about National Science Day 2018. 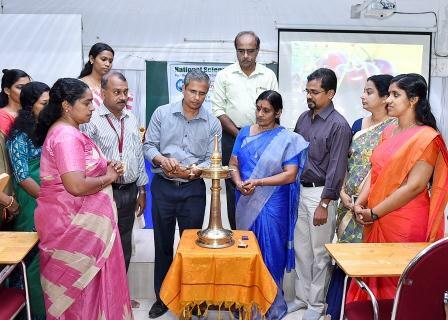 Dr.Roy Joseph (Scientist, Sree Chitra Tirunal Institute for Medical Science and Technology, TVM) was the Chief Guest and inaugurated the function and gave the inaugural address and he shared his view about science and science learning and also about perusing science in higher studies. Felicitations of this program were given by Prof.R.Arun (IQAC Co-ordinator, and HOD, Dept. of English), Prof N. Devadath (HOD, Dept. of Maths) and Dr. Sreekala (HOD, Department of Zoology) . The inaugural function was concluded with Vote of thanks by Dr. Asha Radhakrishnan, Coordinator of the program. The first lecture was by Dr.Roy Joseph. He spoke on the topic Biomedical Devices from Researchlab to Clinic. The second lecture was by Reghunatha Varma, Rtd Professor, D.B.Pampa College,Parumala. He spoke about the importance of science and technology for sustainable future. Following this, students interacted with the experts.